MOF is Singapore's top football leagues, events & competitions organizer! 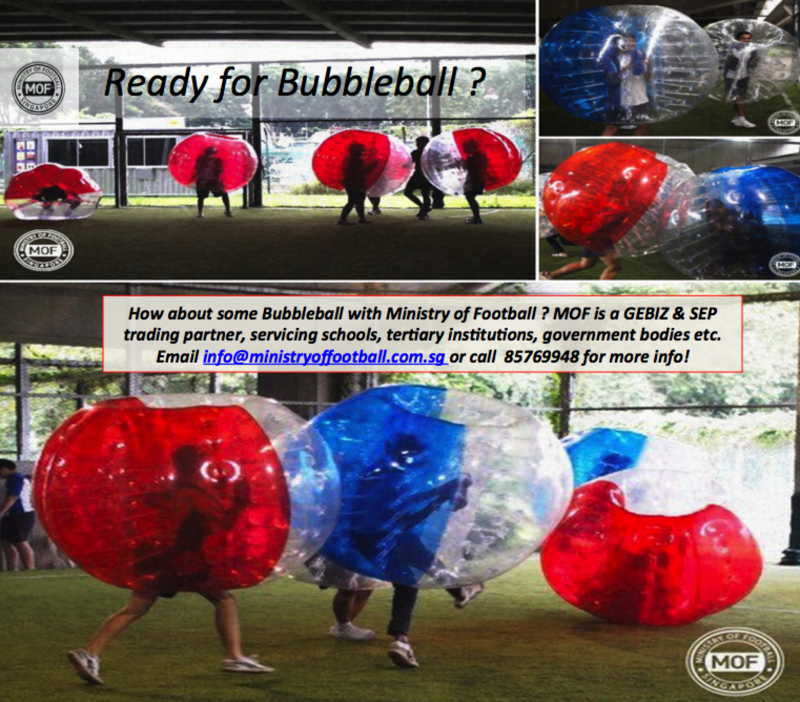 Bubble Soccer Ball SG & Corporate Training Singapore with MOF - Ministry of Football Pte Ltd! BubbleBall Soccer Developmental Fun with MOF! How about some Bubble ball with Ministry of Football ? MOF is a GEBIZ & SEP trading partner, servicing schools, tertiary institutions, government bodies etc. 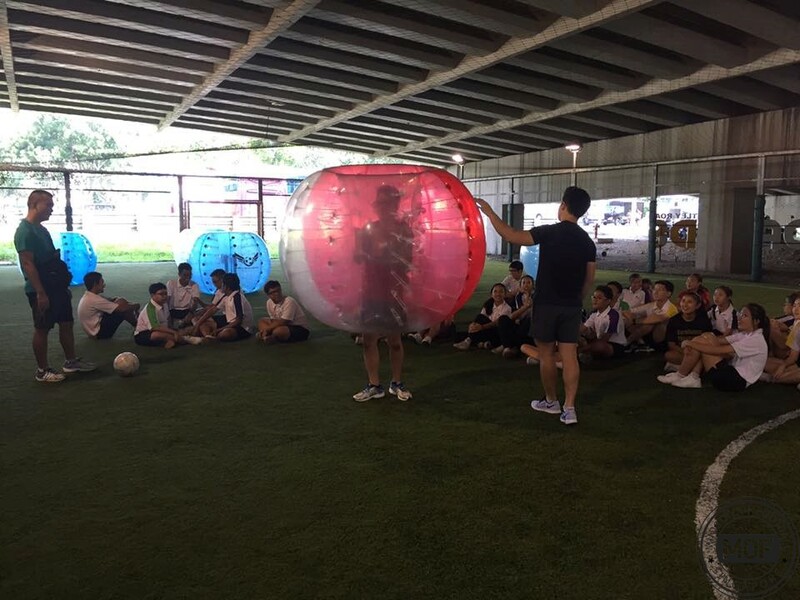 Every month schools, educational institutions, government bodies or companies engage us for some Bubble Ball, Bubble Soccer fun & Corporate Training & Bonding! Please see the pictures on this page for an idea of Bubbleball Soccer fun. We have done events for 35 to 300 participants. The appropriate ages are 9 and above. You can also decide how many hours for the program – whether 1 or more. We have done events up to 5 hours before. For more information, email us at info@mof.com.sg or whatsapp us at 85769948 ! 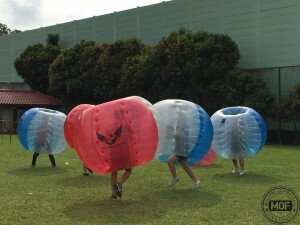 Please refer to the pictures on our website to see the type of bubbleball suits we use: the legs of each participant are outside of the bubbleball (making it very easy to wear the bubbleball, and also to exit the bubbleball). This is our preferred and very safe type of bubbleball (as opposed to the full-body-encased type, which we feel are a high risk). The cost of our our services is typically $30 per hour per student with a minimum number of 35 participants. With larger numbers in each session it becomes much cheaper. Note however, waiting time for each team of participants must also be factored into consideration: generally, the more participants there are, the more waiting time there will be unless more pitches are used (in which case costs will go up). One hour booking = 45 min of game play = 4.5 games = 8 teams play once. how many participants will there be in total? Are the students arriving staggered, or all together? 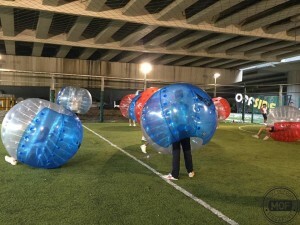 Bubble ball is typically held at a partner venue with sheltered facilities, and in 5-a-side sized futsal courts – big enough for a game of no more than 10 minutes for 10 kids in each court. This should give u an idea of how much space is required (many people underestimate the space required – which is sizable. Caged futsal courts with padded flooring also ensures safety within boundaries. 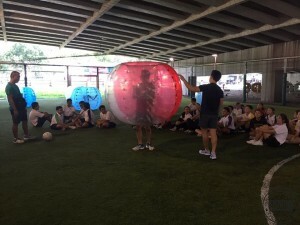 However, if you choose to hold it in your own venue, you will need to ensure that there is ample space in your own location to accommodate our bubble ball activity, and all obstacles are removed. We have four modes of bubbleball : Bubbleball Soccer / Dodgeball / Captain / Invasion. Please see below for more details. There can only be 10 players in the session. The ball used can be either a standard futsal sized ball or a normal soccer ball. There would be a designated area for participants to start the session. The game will not start until all participants are within the starting zone. There are no penalties within the game. The court used would be a futsal soccer court of 15m by 12m length by width. There can be one goal keeper within the game that has the privilege of staying within a 1m radius from the goalpost. Other players will not be able to enter this radius. Game will last for 5 mins each. When there is a goal, the game will restart at the center line. The game will commence upon a whistle blow by the referee. The first possession will be with the team that reaches the ball the fastest. There can only be 10 players in the session. The ball used can be either a standard futsal sized ball or a normal soccer ball. There would be a designated area for participants to start the session. The game will not start until all participants are within the starting zone. When particpants are knocked down, they have to stay down until the game is over. Participants who stand up would be penalized. The game would be played in a best of 3 format. The team that manages to knock down all the opponents first would win. A knock down is when the Bubble Suit touches the ground. Captains would have to be announced before the game is commenced. The winning team would be the participants who can get the captain from their designated zone to the opponent team’s designated zone the fastest. When the captain falls, the team would immediately lose. A fall is when the Captain’s suit touches the ground. All team members must travel from their zone to the opponent’s zone. The team that manages to do so the fastest would win. When a player falls down, there is no penalty and he can get up and continue the game. We take a well-rounded holistic education very seriously, and also offer various forms of youth & adult Corporate Training. Ministry of Football Pte Ltd is Singapore Football’s top leagues, news, competitions & all things SG football. We have built the strongest singapore football community and continue to build our MOF Leagues so that you the Singapore Football enthusiast will have at least one SG football league which can involve you. With our MOF Youth Academy nurturing singapore football talent from the age of five, we at MOF are very serious about creating pathways for Singapore football from Kids Academy to the Singapore national team, or simply for values-training in sports education, which we believe is an essential part of youth development, through our Youth League, Sat/Sunday/Corporate/Minor sg football league in between.